Welcome the next installment of my year-long look back at a decade defined by its extremes. Rap versus grunge; mullets versus pixies; Saved by the Bell versus NYPD Blue – the 1990s had it all, and then some. Every other week I’ll be reminiscing about some facet of the 1990s, potentially drowning in some ill-forgotten nostalgia despite my best efforts otherwise. Serving as inspiration is an utterly ridiculous but nonetheless intriguing list created by Huffington Post — 1990 Things from the 90s to End the Nostalgia Once and for All – and I’ll be using a random number generator to pick each week’s “topic.” So don’t have a cow, man, if I ask you to talk to the hand while take this sweet ride through the 90s. Word to your mother. Well then. So this series took a quick turn, right? But that’s the 90s for you. Bubbly and brutal. Is it weird (or telling) that the 1990s were bookended by two major cults that made the news? During the decade’s latter half, we had the Heaven’s Gate folks. (I’ll refrain from saying too much in case they happen to come up later in the list. Suffice to say, Google will help if you’re not familiar with them.) And early on, we had David Koresh and the Branch Davidians of Waco, Texas. The “Wacko of Waco?” Yep, I remember headlines like that. I also have a vague memory of kids throwing around Koresh’s name in high school as if it was some sort of slur. But…things are too fuzzy for me to be certain of it. I’m also sure that this scenario came up in my current events/economics class, as our teacher them was quite hip to all the news, everywhere. 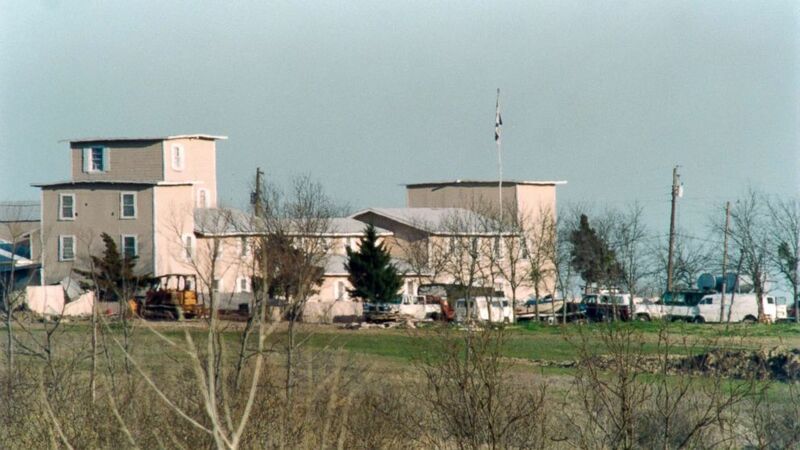 I can’t say that I hold any sentimentality for what happened, or even paid much attention at the time, but history states that in early 1993, ATF officials bombed/set fire to/destroyed the compound of the Brand Davidians, a religious cult led by polygamist and weapons hoarder David Koresh. I believe (and could be wrong) that this was after an failed ATF attempt to infiltrate the compound, resulting in the death of a few government agents and several cult members, and a weeks-long standoff. Koresh and dozens of his followers were killed in the fire. While neither Koresh nor the raid conjure up any personal feelings, it bring to mind sensationalism. Particularly in the news. I suppose I was old enough then to recognize that the news was more than just a bunch of boring talking heads who tended to interrupt everything good on TV. (Lordy, was I ever mad when the Iran-Contra hearings were shown in place of my favorite sitcoms in the late 80s!) But more than that, with the advent and growth of cable, television was mad on vying for everyone’s eyeballs. So the crazier the news, the better. Most of us didn’t have the Internet in the early 90s, so TV news (and, by extension, talk shows) was the mostly accessible place to go for your regular scandals and everyone’s thoughts on them. For myself, early in the decade I was glued to the coverage of the first Gulf War. As my first “televised war,” I couldn’t get enough of watching reporters and soldiers tread the same sandy landscape of death and destruction. It was fascinating, and very sensational. And everyone I knew was talking about it. With the events in Waco, everyone sure knew about that, too. And most opinions I heard in my conservative-ish surroundings tended to fall on the side of “it’s too bad what happened, but Koresh was nuts.” What I recall seeing of Koresh in those days made me think that he wasn’t “all there.” And newsfolks regularly touted that he and his followers were into some illegal things, which I can also believe. Was it necessary to go in and obliterate the place? Likely not. is Koresh coming back from the dead to save the remaining Branch Davidians of today who believe such? Likely not, as well. Next Xbox: Goodbye or Hello?